Since Claire & I moved into our house a couple years ago, we’ve had a constant battle with the lights throughout the house. Like most modern houses, it has a mixture of standard light bulbs and the small halogen lights. Neither one of those types of lights have been particularly long lasting, however the small halogen down lights have been particularly flaky. In the last few months, we’ve had a collection of different light globes blow throughout the house and after replacing the blown light bulbs – no banana. We tried switching different bulbs from other light sockets, different brand lights and different types/styles of lights but to no avail. Claire and I were at the point where we thought the light socket had some how died because no matter what we tried, we couldn’t get the lights to work. Today we tried again and were able to get them to work with a lot of wiggling & jiggling of the light bulb in the socket. I’m not really sure how that works but even when screwed in tight to the socket, the light bulbs won’t shine but after unscrewing them a little, wiggling this way, jiggle that way – they seem to come good. You’d assume that if it works less than 1/4 of a turn from tight, that it’d definitely work when tight but that doesn’t seem to be the case. Despite the annoyance of them not working for so long, its good to have all the lights in the house working again. After checking with Claire about why he might be grumpy, it turned out it was because the computer kept freezing when he was trying to watch one of his favourite shows via ABC 4 Kids. Claire tells me that it did it a few times and that at some point, the computer was giving her a temperature warning – which I haven’t seen since the days of overclocking CPU’s. 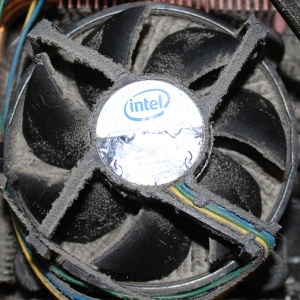 A quick investigation shows that the fan & heat sink for the CPU are covered in dust. The photo probably doesn’t do it justice but the heat sink is completely filled in with dust and the fan blades are coated as well. I clean everything up with a small stiff bristle paint brush, which Claire graciously let me use and we’re back in business. Claire walks past the computer and on the way to the bedroom tells me that the computer is making a weird humming sound. Further investigation shows that it isn’t anything usual except that the CPU fan can actually spin properly now as it isn’t being restricted by the dust between it and the heat sink and the additional weight of it caked on the underside of the fan blades. A couple weeks ago, Stephen mentioned to me at work that Schick had a promotion running in facebook in which you’d receive a free Schick Hydro 5 – the latest Schick men’s non-disposable shaving razor, just for liking the Schick for Men Australia facebook page. Like most males, I’ve tried a whole swag of different razors from cheap disposable razors, various Gillette, Schick and electric razors. For my skin, I find that a razor gives me less irritation then an electric razor and for quite some time now I’ve settled on the Schick Quattro Titanium as my razor of choice. It is sharp, a nice flexible head and it gives a close shave. After trying the new Schick Hyrdo 5 razor, I’ve now found a replacement and my new favourite razor. While the head of the razor feels a little bigger than the Quattro Titanium, the razor glides through stubble and over your skin. I was particularly impressed with the closeness of the first pass as well, it was nearly completely smooth and I had even less irritation than I normally would with the Quattro Titanium. Schick are suggesting that the new Schick Hyrdo 5 is the best shave for your skin and I whole heartedly agree. I really do think it is the best men’s razor I’ve ever used, certainly for my skin. If you do use a razor, I’d recommend you pick on up next time – if for no other reason than to see what the latest shaving innovation is – it might surprise you! The Surfers Paradise car park located under Circle on Cavill houses a lot cars, which range in quality from complete crappers all the way up to the unobtainable. 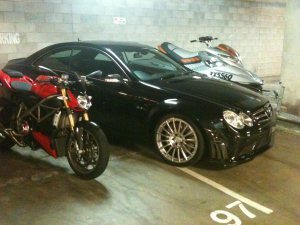 One bloke in particular, I’m quite sure takes great pleasure in parking his car, his motorbike and his jet ski – spread across two car parks. 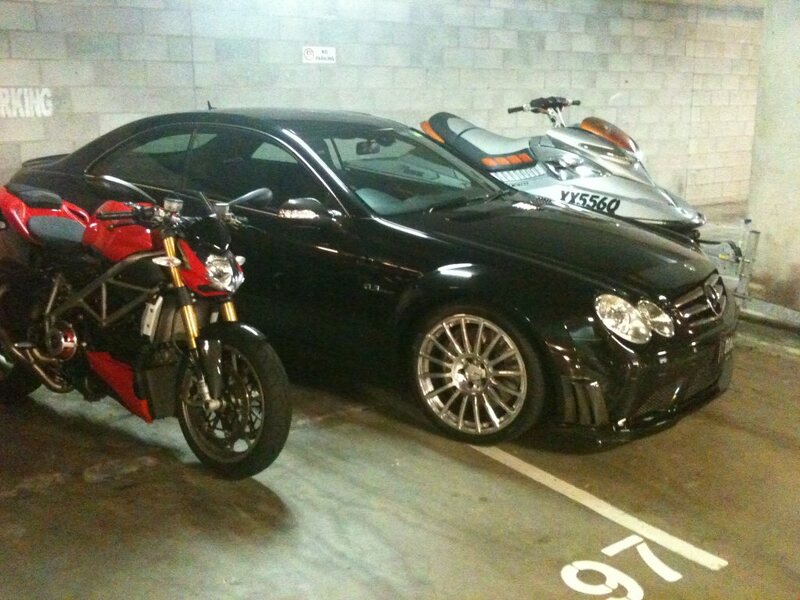 For those that don’t recognise what is in the picture, the motorbike is a new Ducati which start at about $25,000. Next we’ve got the Mercedes SL63 AMG, which packs a 6.2L V8 producing 385Kw and 630Nm of rubber melting goodness and will lighten your wallet by about $440,000. To cool off, of course you need a Seadoo jet ski and they are about $25,000. Amazingly, the guy that owns these three happiness creation devices is under 40 years old and if I ever get a chance to have a word – I think I’ll feel compelled to ask him what the hell he does!